Combine dry ingredients: from oats to dried cranberries. Combine wet ingredients: from honey to soy/rice milk. Stir dry and wet ingredients together until just combined. Portion cookie dough using 1/3 cup measure and place on baking tray. Bake for 22 minutes or until lightly browned. 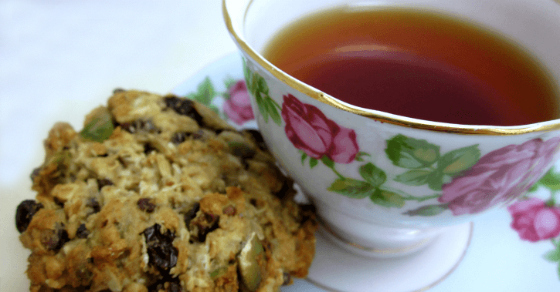 I hope you enjoy these perfectly healthy (therefore guilt-free) cookies! They are a household favourite! Although I haven’t baked any for a couple of weeks now because it’s been soooo hot here! Healthy and delicious? YES please!! These sound amazing! Thanks for sharing! I’ve found different ways to satisfy my sweet tooth. This definitely is a favourite! I’ve been wondering! Three months is incredible. I’d love to hear the changes you’ve noticed in your body, emotions, energy, etc. A three month review? I always think I couldn’t do this, but I actually prefer local honey and local maple syrup to refined sugar so there’s no reason I’d even miss out. At least at home. Okay, I have a confession to make. I wrote this and scheduled it and on the Friday that just past I had a sliver of my mom’s strawberry-rhubarb pie… because well, STRAWBERRY-RHUBARB PIE! So technically, it was still 3 months but I’m starting at day one. I feel great though. I haven’t lost any more weight or inches than my last report but I feel mentally/emotionally great. More stable. It’s funny you mentioned an update. I’m working on a currently post for the end of the month and was thinking of sharing a bit about the sugar-free journey. Thanks for sharing… aren’t maple syrup and honey the best?! These look amazing! I just pinned and can’t wait to try them. I love sweets, obsessively so, and am always on the lookout for healthier versions. These look perfect :), Thank you, Jennifer! Oooh, you’re in for a treat Candace! These are fabulous! They’re a great treat and they’re hearty (which means it’s harder to gobble up the whole batch in one sitting)! You’re amazing! I can’t believe it’s month 3! WOW! I’ve tried giving up sugar before and I know it isn’t easy. One of the things I love to do most in my kitchen is create treats for my family that are yummy but also healthy. I love adapting recipes to “healthify” them. Thanks for sharing this one. It looks delicious and hearty. I know! 3 months?! I can hardly believe it myself. They are hearty and filling… which is a great combo for a cookie because it means they won’t get gobbled up in one sitting! Thanks for pinning my friend. Oh the strawberry-rhubarb pie… even though it was a sliver of a pie, it opened up crazy cravings for sweet stuff! I’ve been good though. We just wrapped up our annual family garage sale and there were treats galore. I was able to resist! I think the big test will be Christmas. Oh my. I might have to make some exceptions *wink*.